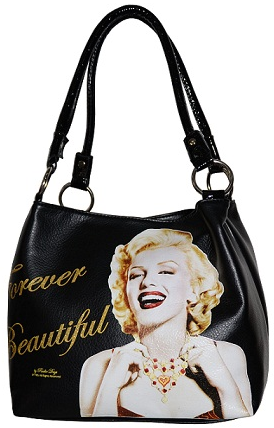 Marilyn Monroe Soft Tote টাকার থলি. Synthetic leather made শীর্ষ zipper closure Back zip pocket Fully lining interior Double shoulder straps Open slip pocket 12"W x 10.5"H x 6"D. Wallpaper and background images in the Handbags club tagged: handbag bags women's fashion. This Handbags photo contains কাঁধে ব্যাগ. There might also be খুঙ্গি and সন্ধ্যায় ব্যাগ.